05/01/14 – Added game ending link. A title which many of you may not have heard of, considering publicity on the game was pretty much never done for the C64 for this game. Bugs Bunny is as special as Daffy Duck, as they are both from the same company, both have the same artist and both are unreleased due to the sad demise of Hi-Tec back in 1992. They were even in development around the same time. The thing is, Daffy Duck was finished just before Hi-Tec bit the bullet, and Bugs Bunny was pretty much there, but too early for review. Otherwise Bugs Bunny would have had the Zzap review treatment, and become one of GTW’s most wanted titles as well. Not much was ever known about the game, until recently when GTW got in contact with Nick Taylor by chance to ask about some other titles. It was then discovered that Nick was the programmer of the game. After some questions, it was discovered that the game still existed and is infact complete, like Daffy Duck. Shocked?… Well, Nick told GTW that he kept all his disks, but we persued to get in touch with Dave Palmer and ask about the game. After some big searching by Dave, the game has been found!.. Complete, but only missing music and final bug testing. Dave Palmer has kindly passed Bugs Bunny onto GTW and has allowed us to release the game for the first time. However, this game is not to be distributed for any profit, and is distributed on GTW freely. We also acknowledge the copyright of the characters to Warner Bros. If you want to know what Dave is up to now, he is still developing games under David A. Palmer Productions for various platforms. 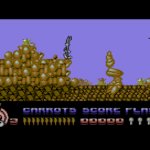 The game consists of Bugs Bunny making his way through a scrolling set of 4 levels, where you had to collect items and carrorts, jumping around platforms. The aim is to find items of evidence on each level, then finally a key to unlock a door at the end of the level. At the end of each level you must catch the culprit on camera using a photograph flash. You also have photo flash abilities to fend of and freeze enemies. Bugs can also dig underground in true Dig Dug style and go into caves, which is quite neat! If you want to see the ending, then check out the ending here. Originally when Nick was told that the game was never released, he was surprised as he got fully paid and the game was complete. So it seems Bugs Bunny suffered the same fate as Daffy Duck and may never be seen. 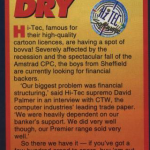 Interestingly though, the year is set to 1993 and no publisher – so it looks like Dave Palmer was considering releasing the games after Hi-Tec. In 2015, a very early preview with 2 levels was found on Ash and Dave’s disks, which shows a significantly different version of the game. The panel is slightly different, but the key differences are in the main game – where there is no burrowing involved, but you have to climb up walls and explore caves. The preview is dated 1991, which suggests the game underwent a heavy redesign at some stage. It is a great curiosity, and in 2016 we finally added that preview to the links below for you to check out. NOTE: This game is (c) Warner Bros, and is distributed freely without any profit. Thanks to Dave Palmer for locating the submitted title. 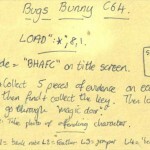 “Bugs Bunny will exist, I have amassed a very significant retro collection over the years and ensured that I retained all my source code disks, PDS dev system etc – Bugs Bunny is there somewhere..
As for the game, I can’t make my mind-up if it was based on a spec from Hi-tec or based on another format (Amiga or ST? ), I thought the later. It was a 4 way scroller where you had to collect items/carrots through a combination of jumping on platforms when above ground or digging underground into caves (dig-dug style) when underground.. I think there were around 5/6 quite big levels with a bonus game at the end of each. I worked (and lived with) Ash & Dave for a while and we knocked out a number of games for Hi-tec and Codemasters, was certainly good fun. Ash did all the graphics and Dave and I tended to work on separate projects – Daffy Duck was one of Dave’s, Bugs Bunny was one of mine. Just awesome! Frank, great job! I really appreciate it! I like stories like that :]. Thanx :].